GeneMarker® HID human identity software easily processes files from ABI®PRISM 310-3100-3130-3730-3500HID genetic analyzers (.fsa, .hid) and chemistries (including GlobalFiler™ 6-Dye™,Identifiler®, Minifiler®, PowerPlex®16, PowerPlex®ESI, PowerPlex®18D, PowerPlex®21) and is an expert system for forensic STR analysis. 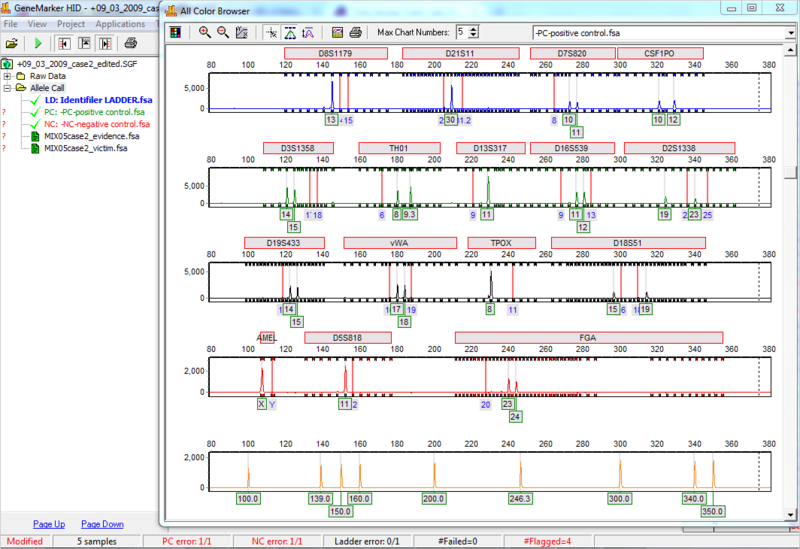 It contains time saving analysis tools: A project summary bar in the main analysis window of GeneMarker HID software alerts the analyst immediately with automated positive and negative control concordance, and notification of any allelic ladder errors (such as out of bin, variant or virtual allele error). The auto-panel adjustment selects and reports the best fit ladder for each sample. The Project Comparison Tool provides supervisors with a linked comparison of two different analyst's results and is also an excellent validation tool for instrumentation or multiplexes; it aligns two projects and identifies differences in peak size, height, and allele call. Additionally, if an analyst edited an allele call, the results can be immediately corroborated. The laboratory administrator can control access rights for individual users and has access to an Audit Trail when ‘Record Data Edit History' is selected in the User Manager Settings. Any change to allele calls in the analysis will be recorded. Changes can also be recovered in the Edit History feature. 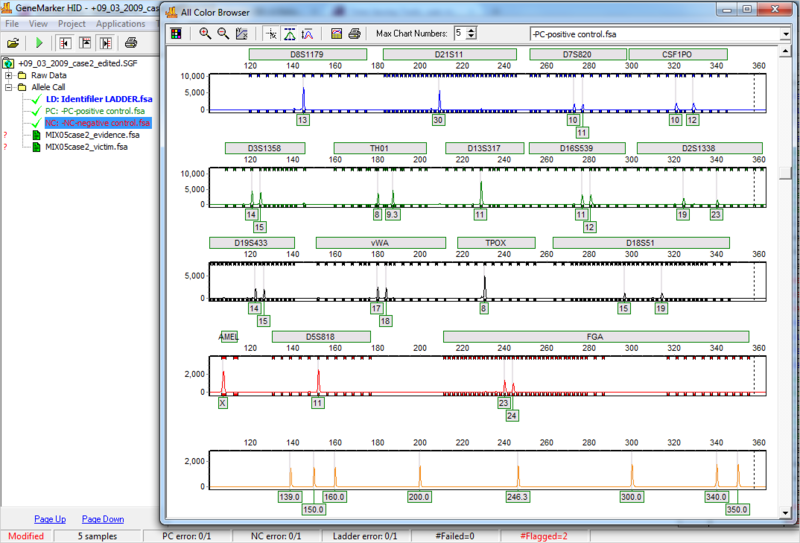 GeneMarker HID software uses the analyst specified positive control to automatically detect any problems with the allele calls of the positive control(s). The figure on the left has positive and negative control concordance. The information is listed in the Summary Bar at the bottom of the analysis screen. The figure on the right indicates a problem in the positive control for this run. The Summary Bar lists PC error 1/1 and the electropherogram has red vertical bars at the bins of the expected peaks for the selected positive control. If any detectable peaks occur in the negative control the peaks will be flagged and the Summary Bar will indicate NC error. The project comparison tool aligns replicate projects; automatically detecting any differences with a peak-by-peak comparison. This tool reduces fatigue and speeds the review when comparing concordance of two separate analysts. Project comparison also provides validation assistance by comparing replicate projects from different instruments, chemistries or analysis parameters. The peak-by-peak comparison is summarized in the table at the right. Results that are in agreement with each other are not highlighted (as seen here with samples 6 and 7 in the table). 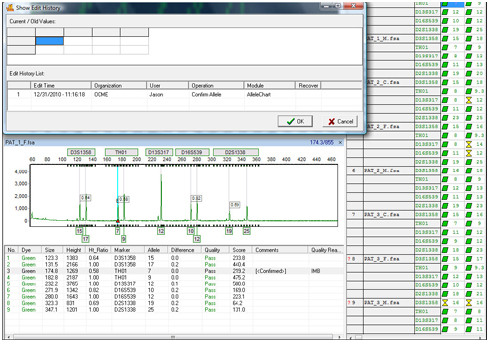 Any differences between the samples will be highlighted in the tables and electropherograms. By using the scroll bar to scan for yellow highlighting, the reviewer or supervisor can quickly zoom in on the areas of interest by double clicking on the yellow cells. The administrator activates User Management from the Help drop-down menu when after installation of GeneMarker HID software. User management provides control of user access rights and automatically generates an audit trail of all edits. Select from Access Rights, depending on the User Type. The History tab provides details of program and user activity. Edit History provides an audit trail of all edits; Time, Organization, User, and Operation type.